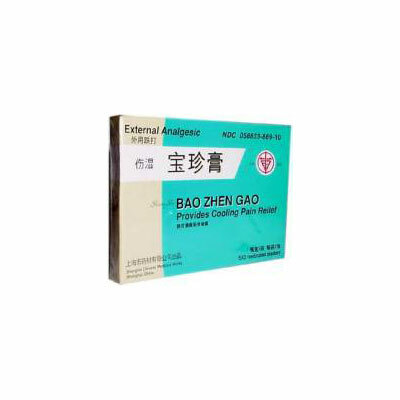 Medicated patches for minor aches and pains of muscles and joints associated with simple backache, shoulder pain, arthritis, strains, bruises and sprains. Sports injury or other traumatic injuries to muscles and tendons. Neuralgia, rheumatism, osteoarthritis, rheumatoid arthritis. Herbal plasters for temporary pain relief. The affected are should be cleaned with gentle soap and warm water before application. The herbal medicine is inside a cloth tape with adhesive backing which is available in plaster which are approximately 2”x 3”. The plasters are attached to a piece of cellophane: two plasters per piece of cellophane. Peel the plaster off the cellophane and place on the affected area. Use tow or more plasters if necessary to cover the entire area. Apply plaster to affected area not more than 3 to 4 times daily. Children under 2 years of age do not use. For external use only, avoid contact with the eyes and mucous membranes. Do not apply on wounds or damaged skin. Do not bandage tightly. Do not use with a heating pad. Use only as directed. Do not apply on wet or sweaty skin, extremely hairy surface of skin. Store unused plasters in a tight container at a temperature not more than 86ºF (30ºC). Discontinue use if excessive irritation of the skin develops. Stop use if condition worsens, or symptoms persist for more than 7 days, if this occurs, consult a physician. If pain persists for more than 10 days, or redness is present, or in conditions affecting children under 2 years of age, consult a doctor immediately. Keep out of reach of children to avoid accidental poisoning. Do not use if you are pregnant or nursing.